Last week I allowed myself to rest my injured shoulder. Unfortunately, this means that I took a break from my computer work. Last weekend, I made a conscious effort to PUT DOWN my smart phone, stretch out my shoulders, improve my posture, and take breaks to stretch out if I needed to do ANY amount of computer work. The ice pack became my dear friend. I had to take a break from technology in order to help my arm heal, so I did not write my usual in-depth article. I love to read. I read articles about all sorts of interesting things. When I am unable to read an article in it’s entirety, I save the link for future reading and research. Here are some of the articles and posts that I saved this past week (with a little summary intro). 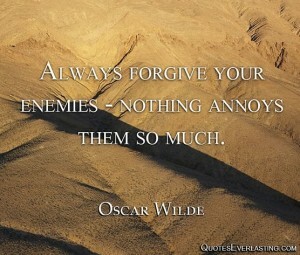 Forgiveness – What are the real consequences of holding on to anger and resentment? According to Dr. Steven Standiford, Chief of Surgery at Cancer Treatment Centers of America, refusing to forgive makes people sick and prevents them from recovering. Forgiveness Therapy is now being used to help treat cancer and other diseases. Read more about it. Cold Water Immersion – According to Tony Robbins, cold water immersion can improve lymphatic circulation, cardiovascular circulation, reduce muscle inflammation, boost happiness levels, and increase weight loss. Cold water immersion CAN change your life, by making you and your body more powerful. Read more about it. Insomnia’s Link to High Blood Pressure – Researchers have found that people that suffer chronic insomnia that took more than 14 minutes to fall asleep had a 300 percent higher risk of high blood pressure (the risk increased the longer they took to fall asleep). Read more about it. Drugs That Cause Memory Loss – Many commonly used prescription drugs as well as over the counter drugs can cause memory loss. Drugs that begin with “anti” (antihistamines, anti-depressants, etc.) will most likely affect your acetylcholine levels, which is the primary neurotransmitter that affects memory & learning. Sleeping pills are widely believed to cause memory loss. Statin Drugs – According to Dr. David Perlmutter, 25% of the cholesterol in the human body is found in the brain. A recent study found that in the elderly, those with the highest levels of cholesterol showed the best memory function and those with low cholesterol had an increased risk for depression and even death. Statin drugs are now required to carry a warning on the label that lists memory loss as a side-effect. Big Food and Its Control over Nutrition Science – The Alliance For Natural Health recently published an article describing how the Society of Nutrition, whose membership includes companies like Pepsi, Coca-Cola, Nestlé, Monsanto, McDonald’s, and Mars, actively promotes policy decisions. As a consumer, I am concerned about the potential conflict of interest that exists when nutritional “advice” is used to shape public policy, particularly if Big Food companies fund the research upon which it is based. Read more about it…. I plan to write a detailed post on several of these topics and would very much appreciate your feedback.